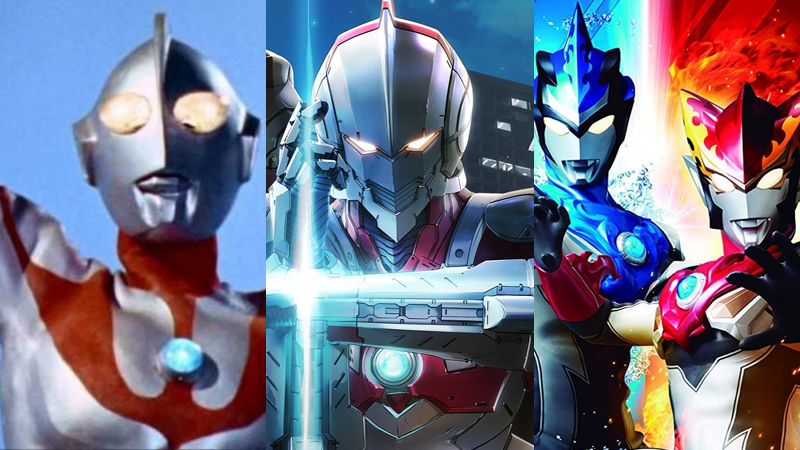 Three generations of Ultra Warriors—the original Ultraman, the armored star of the new Ultraman anime, and the brotherly protagonists of last year’s Ultraman R/B. Cover art for Shout! Factory’s 2013 DVD release of Ultra Q. Before we get to Ultraman, the Ultra Series itself actually started before its most iconic character even existed. In 1966, special effects studio Tsuburaya Productions launched Ultra Q, a sci-fi Tokusatsu series—the same sort of SFX-driven action shows and films that cover everything from Godzilla to other Japanese superheroes that Ultraman would go on to inspire (like the Kamen Rider and Super Sentai franchises). The show followed paranormal investigators as they tackled threats ranging from the supernatural to the more alien and...well, of the giant monster kind. Tsuburaya had been asked by broadcaster TBS to incorporate more Kaiju stories to draw in kids. The show was a massive success, cementing its legacy as part of the grand Kaiju Boom of the ‘60s in Japan—but after it came to an end, just weeks later Tsuburaya quickly followed up with a spiritual successor that would go on to change the Ultra series forever: Ultraman. Ultraman took what made Ultra Q a hit—the Kaiju—and gave them a similarly-sized hero to face off against. Set in a world where an organization called the Science Special Search Party (informally known as Science Patrol) safeguards Earth from monstrous aliens, Ultraman followed the adventures of Shin Hayata, an SSSP officer who, after fusing with an alien Ultra Warrior from Nebula M78, gains the ability grow in size and become the giant hero Ultraman. As Ultraman, Hayata could use an Ultra Warrior’s enhanced strength and energy attacks like the powerful Specium Ray (fired by Ultraman making a cross-gesture with his forearms, which would become the character’s iconic pose), but his transformation—which required solar energy—was on a timer of around three minutes, giving him only a limited time to defeat the monster of the week. 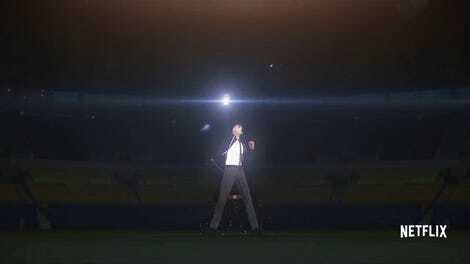 Ultraman fires his iconic ultra beam attack, the Specium Ray. The show proved to be even bigger hit than Ultra Q, but Tsuburaya faced a bit of a problem: Ultraman ended with Hayata and Ultraman being resurrected after a fatal scrap with a monster called Zetton, but in the process Hayata was separated from the Ultra Warrior, and lost all his memories of ever having been the hero. And so when TBS tasked the studio with a follow-up, a new protagonist—and a new Ultra warrior—had to step in, beginning a seasonal cycle of new heroes and new Ultraman designs (an idea Toei would borrow for both its Kamen Rider and Super Sentai franchises in the ‘70s). Starting with Ultra Seven in 1967, and then across another 28 TV series and countless film spinoffs in the decades since—some of them direct sequels or continuations of the universe established in the original show, some simply part of the Ultra multiverse—Ultraman became a staple of Japanese kids’ TV. There have been several attempts to bring the franchise beyond Japanese shores—in the West, it’s primarily been in subtitled and dubbed forms, with places like Crunchyroll, dedicated streaming platforms like TOKU, and even Hulu playing host to several of the series in recent years. But beyond dubbing the Japanese shows, late last year, Tsuburaya announced new plans to license the franchise out for Western audience in a major way, hoping to establish a potential complete reboot of the series. Before all that though, we have Netflix’s plans to introduce Ultraman to international audiences...although it requires its own bit of explanation first, and a sideways trip into another medium. 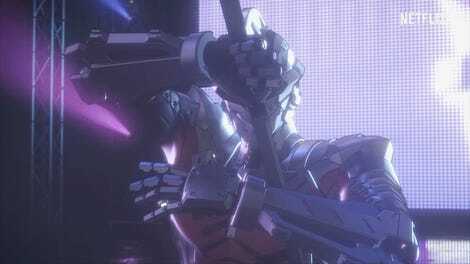 Netflix and Production I.G.’s new animated series isn’t actually an original entry in the Ultra series—it’s an adaptation of Eiichi Shimizu and Tomohiro Shimoguchi’s Ultraman manga, which began publishing way back in 2011 (English language translations have been offered by VIZ media since 2015). It also follows a setup that actually requires you to unlearn a bit of what you just learned about Ultraman. The Ultraman manga—and the Netflix show—is actually a direct sequel to the original Ultraman TV series, but set roughly 40 years after its climax. With Ultraman gone and Earth free of alien invasion, the SSSP has disbanded, and Shin Hayata (who still doesn’t remember having been Ultraman in the past) has moved on with his life, starting a family and raising his son Shinjiro. When not Shinjiro starts exhibiting superhuman abilities as a child and alien threats begin to re-emerge, Shin’s memories—and the revelation that his past fusion with Ultraman transformed him into a human/Ultra Warrior hybrid—are reawakened, and he’s called into action as Ultraman again. 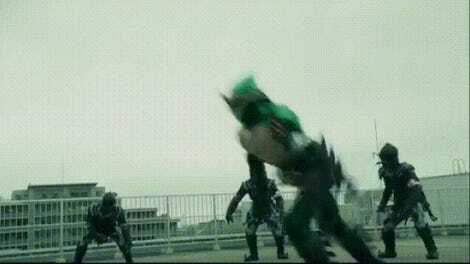 Shin reveals to his son that he is Ultraman. Except there’s a major difference between the Ultraman Shin becomes this time: He can no longer grow in size or transform into the Ultra Warrior. Instead, he fights in a specially designed set of power armor that recreates many of his old abilities, while enhancing the now latent superhuman powers he and his son share—namely super strength and the ability to leap massive heights, while the suit itself can fire the energy used to create Ultraman’s iconic beam attacks. In the continuity of the manga, Shin operates as Ultraman for several more years using the suit, until the return of one of his oldest foes, Bemular (based on the similarly named Kaiju from the original TV show), leaves him gravely wounded—forcing Shinjiro to step up and inherit the Ultraman mantle and suit as his own. The lack of size-changing and the fact that Ultraman is an Iron Man-esque suit enhancing a superhuman hero is just one of the bigger diversions the Ultraman manga takes from what’s become of the TV show franchise—it has all sorts of its own connections to make with the franchise’s now 53-year-old legacy, offering new twists that you’ll have to read it discover yourself. Or, you know, watch the new anime! The world of Ultraman may have only had an impact outside of Japan in fits and starts, but with Tsuburaya’s big push to make its legendary hero a truly global phenom, and his arrival on a platform as wide-reaching as Netflix in this new form, there’s never been a better moment. A whopping 53 years after he first exploded onto the scene, one of Japan’s most beloved superheroes is just about ready for a worldwide spotlight.